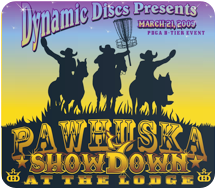 The Showdown At The Lodge was a success as players from the surrounding area came to play in this Dynamic Disc event. The Osage Open was a non-PDGA, non-TDSA event but it had plenty of disc golf. The first round was actually played on a new course at the Williams Park, a public park near downtown Pawhuska. Afterwards everyone took to throwing on the Island Course at The Lodge. As if two rounds on two of the most popular courses in Oklahoma wasn’t enough the Oklahoma State Championships had much more to offer. Some of the players were able to participate in MTA (Maximum Time Aloft) and DDC (Double Disc Court), distance, and freestyle events. 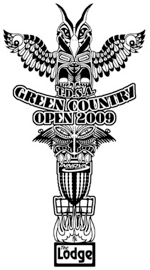 The Green Country Open was a National Tour with the PDGA. It was put together by Twisted Flyer, T.D.S.A and countless volunteers. The 4 day event included a wedding on the Island hole and numerous touring pros playing on the courses including Avery Jenkins, David Feldberg, Nate Doss, and Valerie Jenkins.